I'm always on the hunt for teethers that are safe, non-toxic and soothing for babies. Olivia got her first tooth at just three months old, so we're gathering our arsenal of teething toys for our baby boy early! 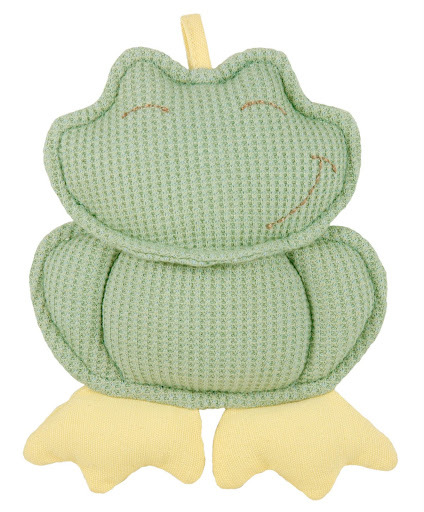 Given our affinity for frogs and for green products, Dandelion's frog teether and rattle toy in one fit the bill perfectly! This machine washable teether is made from organic cotton and stuffed with natural corn fibers. The frog's body features a waffle-weave, providing texture to engage baby, and his feet are made of canvas material for additional texture to sink sprouting teeth into. I also like that in addition to gumming this little frog, babies can use it as a rattle toy. Dandelion's eco aspects include minimal, 100% recycled packaging, which is printed with vegetable inks, and none of their products contain harmful BPA or phthalates. All of their toys are made from organic cotton and low impact dyes. I have also previously written about Dandelion's reusable feeding gear, and how it makes a great option for kids' outdoor birthday parties! Read about their tableware for tots, made from corn PLA here. Visit Dandelion to peruse their extensive collection of toys and gear for babies and toddlers, and be sure to check out their brand new organic cotton layette, which just recently launched.